Do you want a floor that’s long lasting and cost effective? Laminate flooring just might be the right option for you. 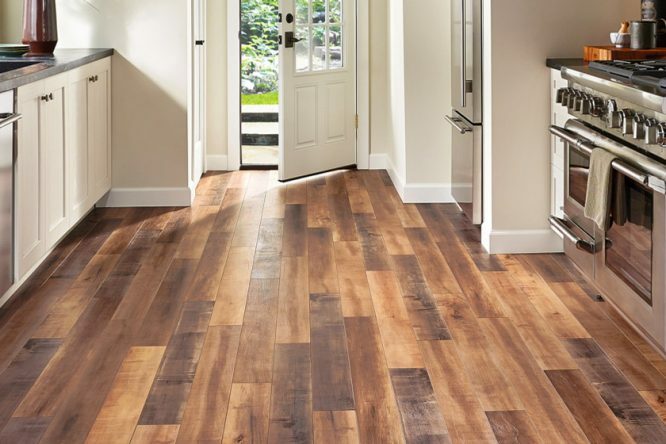 As a leading Denver laminate flooring supplier and installer, we are the only company you will need. From bringing our mobile showroom to your front door to making sure everything is perfect after the installation, we are the one-stop-shop for your flooring needs. We are excited to help you with your new laminate floor. Laminate has so many benefits that it seems to grow in popularity year after year. You want floors that look expensive, but you don’t want to put out the money; you’re not alone – and that’s why laminate flooring is so popular. It’s much less expensive than hardwood floors are, even though the material essentially looks the same. Also, since it’s so easy to install, the installation price is cheaper. Between the affordable product and cheap installation, it’s no wonder budget-minded consumers love laminate. If it’s affordable, it must not be very durable, right? That’s not true at all. Laminate can stand up to anything you throw its way, even if it’s in a high-traffic area. It doesn’t buckle or crack, and you don’t have to worry about fading or chipping. It can even stand up to pets. Some flooring materials are meant for specific rooms, but that’s not the case with laminate. It looks great in every room, from the bedroom to the living room. You can put it just about anywhere in a commercial or residential property. Just keep in mind you probably don’t want to install laminate in the kitchen, laundry room, or bathroom. This type of flooring is moisture resistant, but it is not waterproof; that means you need to wipe up spills when they occur. Because of that, you shouldn’t put the floor somewhere where a pipe could leak or burst. Laminate comes in a variety of styles. You can get laminate that looks just like a hardwood floor, or you can get laminate that looks like ceramic tile. It’s easy to find a style that fits your personal needs. In other words, you don’t have to compromise when you go with laminate. If you don’t want to spend your days and nights cleaning your floors, laminate is a good choice. Since the surface is both moisture and stain resistant, you can wipe up spills without any issues. You don’t even need to invest in special cleaners: Just sweep up the floor to maintain a great look every day. You don’t have to varnish or wax it. It will maintain its good looks with a simple push of the broom. If you suffer from allergies, you know how important it is to maintain clean air in your Denver home. Laminate flooring doesn’t trap dust and dander, so it will make the air in your home cleaner than before. Plus, the floor’s underlayment includes a moisture barrier: That means you don’t have to worry about mold growing under the floor. Our mobile showroom is right around the corner, and we are ready to help you get laminate floors you’ll love. Contact us today for a free estimate. We will show you some samples and help you determine what flooring option is best for your home or business.